Last week, I reviewed the Avocado Burst Regulator, a drop-in, inline burst controller designed to be installed in pretty much every gun, giving you basic burst controls along with some other nice features in an inexpensive, easy to install package. That unit is pretty much designed to be the most basic form of an airsoft computer. Today, I'll be reviewing the ASCU (Airsoft Smart Control Unit) V2, which is a much more intense solution to computerizing your AEG. 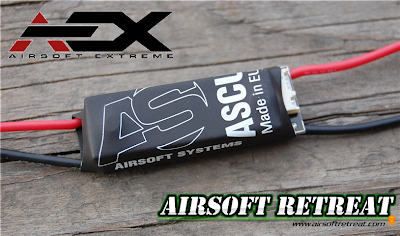 This system is much more specialized and requires a more involved installation, but changes your AEG entirely into something much more extreme. I'll discuss all of the various aspects of this airsoft computer in this review, so keep reading if you're interested in making your AEG a snappy firing machine with zero trigger lag. 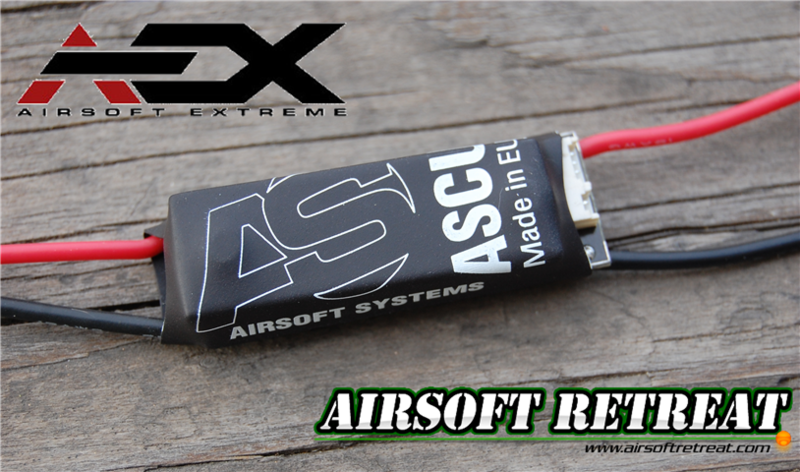 I was sent the ASCU V2 by Airsoft Extreme, who has it available HERE, priced at $99.95 at the time of this review. It comes with everything you need to install it in your rear wired V2 AEG, and comes with a one year warranty against defects to the unit itself. The ASCU was shipped out right away, arriving two days later using USPS Priority, due to it being such a small package. As mentioned before, the ASCU V2 is a drop in computer solution for rear wired V2 AEGs, such as the M16, some M4s, full stock MP5 models, SR25, etc. This model is not designed for ICS AEGs, and a separate model is being released for them. The ASCU V2 replaces the entire internal trigger assembly as well as all of the wiring, substituting it for a microswitch system giving you instant trigger response, that when coupled with the control unit gives you several firing modes, voltage monitoring, active braking, and the ability to remove several pesky gearbox components, such as the anti-reversal latch and mechanical safety lever. The packaging is pretty basic, consisting of a small cardstock box containing the unit and all of the included wiring. The unit consists of the trigger assembly, controller with attached battery wiring, green signal wires, and a manual. The manual is pretty inclusive and can be found HERE. I'd strongly recommend perusing the manual before purchase so that you can assess your abilities to see if you can install it. The computer unit itself is quite small, able to fit easily in a full stock or buffer tube. The unit is modular in design, allowing easy replacement of damaged components as well as the ability to add upgrades in the future. Airsoft Systems is developing a hop-up unit that prevents dry fire once your magazine runs out of BBs, just like a Systema PTW. The control unit is only half of the equation, as it works in conjunction with the replacement trigger unit for lag free firing. The trigger unit has a very small microswitch in place of the shuttle unit that so often breaks due to high voltage batteries. It also has a small mechanical switch that is triggered by the semi-auto cut off lever to facilitate the more advanced features that this unit offers. The trigger unit connects to the control unit by way of four small wires with plugs at both ends. No soldering is necessary with this unit, just plug it in and you're ready to go. Installation is relatively straight forward, requiring you to remove your existing wiring, trigger shuttle assembly, anti-reversal latch, safety lever, and making a few small modifications to your selector plate. For my use, I installed it in my Javelin custom DMR project, which uses a slightly different gearbox design compared to a standard V2, so some slight modifications were required. I had to grind out the inside of the gearbox where the trigger rod sits to allow the unit to fit in well, as well as grinding down a portion near the selector plate to prevent it from short circuiting. For installation instructions, please read the manual found HERE. Wiring run, signal wires should be run underneath ground wire to protect them. Take care to avoid any sharp edges in the wire path. The only major modification you need to make is to your selector plate. First off, you must use a selector plate with a metal contact installed, however you cannot use a full metal selector plate. Secondly, you must cut a 5mmx5mm portion of the plate to ensure proper installation, as well as remove the spring. Once you've got the trigger unit installed, selector plate modified and installed, and wiring ran, you can reinstall the gears, spring, piston, etc, ensuring that you leave out the anti-reversal latch and mechanical safety lever. If you are using a motor with weak magnets, you MAY need to leave the AR latch in, but you can test it out with your gun and see if it's necessary. Run the wiring with control unit through your buffer tube or into your full stock, ensuring you'll still have room for a battery. When using a retractable stock, you'll likely want to use a Crane stock, as the control unit takes up most of the buffer tube. You must install the included small PVC sticker inside the receiver, over the selector plate contact to prevent short circuiting off of the body. If using a polymer body, the sticker is not necessary. Programming the unit is a piece of cake. Once you plug in your battery on safe, switch the selector to full auto and pull the trigger within 2 seconds. The grip will let out a long vibration, indicating that you are in programming mode. An automatic programming sequence now starts, with the number of beeps indicating the mode the gun is in. To select a mode, pull the trigger after the desired beeps are heard. With one beep, the unit is in burst/auto mode, which will fire a 3 shot burst if you tap and release the trigger, and full auto if you hold it down. The second mode is semi and full auto only. The third is semi and 3 shot burst only, and the final mode is semi-auto only in both selector settings. So, you've got the unit installed and programmed, how well does it work? In my experience, VERY well. Trigger response is very snappy, due to the micro switch system and low electrical resistance. You can pull the trigger very quickly on semi-auto and the gun will fire as fast as you pull with no gearbox lock-up in my testing. On full auto or burst modes, the piston will always return to the forward most position due to the sector gear monitoring and active braking. The only issue I've had is that I'll occasionally get 2 round bursts instead of three, and I believe that is due to the loose fitting Javelin semi-auto cut-off lever. I'll swap it out with a different cut off lever and see if it makes a difference. Overall, I was really pretty impressed with the design work that went into this thing. Execution was pretty good, as it works as advertised giving me the burst fire I want, as well as the advanced firing functions such as active braking and jam free performance. The trigger response is very crisp and quick and fits the DMR theme of my gun quite well. I'd like to see a unit that works with front wired guns, as well as other gearbox versions, but for now, this thing is a step forward to a more advanced future of airsoft!